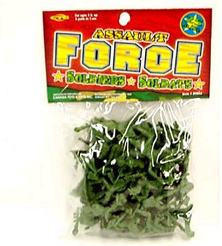 This 25 piece set of plastic miniature soldiers consists of an army of assault force soldiers in classic army green. This set has spanned generations of play for kids who love to recreate combat and battlefield action! Buy 1 for $3.98Buy 2 / Save $0.21!Buy 3 / Save $0.80! Size (inches): 4.72" X 1.97" X 7.09"